Technology and changing attitudes to the workplace are driving a transformation of corporate real estate. Gone are http://flevy.com/blog/wp-content/uploads/2018/10/top-10-trends.jpg 574w" sizes="(max-width: 300px) 100vw, 300px">the days when the real estate function was an overhead and its professionals solely as engineers. FM is coming of age. The next generation of real estate professionals will resemble business managers and leaders. They will combine empathy, strategic thinking, commercial expertise, and an eye for innovation and continuous improvement. Facilities Management (FM) will be an enabler of change and agility. It will be changing from an asset, building and plant centered activity to an end user and outcome focused activity. There are 10 key trends that are transforming the world of work and commercial real estate. Having a good understanding of the 10 trends will allow FM professionals to better manage the transformation of corporate real estate. 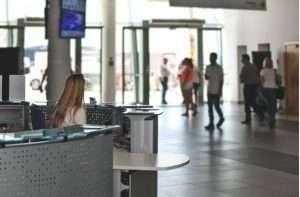 With the changing world of Facilities Management (FM), companies must be clear exactly what they want to measure and manage. The 10 Key Trends in Facilities Management represent a huge opportunity for FM professionals to demonstrate its strategic relevance to the C-Suite as a driver of corporate performance. Outsourcing will increasingly evolve into delivering more complex services. By 2025, it is expected that global outsourced market in FM services will reach $1 trillion in value. C-Suite and corporate real estate executive will now demand more integrated processes. Advisory and transaction services, Facilities Management, and project services are expected to be integrated under one supplier and point of control. A Multi-generational Workplace will require a holistic balanced workplace strategy. Tech-savvy, connected, urban, and educated Millennials will make up half of the global workforce by 2020. By then, organizations will be a fusion of baby boomers, Generation X, and Millennials in one workplace. In the next 10 years, wellness and productivity shall be crucial in employees’ recruitment and retention. Better collaboration with customers, colleagues, and co-workers will be the main driver of workplace strategy. By 2025, companies can expect the existence of 3 levels of collaboration: the formal, the informal, and the serendipitous. Technology is driving a growing appetite for Co-working & Managed Workspaces. In the evolving dynamics of corporate real estate, this will now become a necessity. A much broader range of occupier types are adopting service workspaces. Hence, service offices must be ready to address accommodation needs over the next 3 years. Online channels will soon play an increasingly dominant role in the customer journey. The Smart Workplace is efficient and intelligent use of Internet of Things (IoT). The Internet of Things (IoT) will make possible the use of 25 billion connected things by 2020. By 2025, data analytics will be critical in addressing issues on energy savings, reduction of total life cycle costs, business efficiency, and sustainability. In achieving real estate goals, companies must have smart capabilities in using data & analytics. The market for robotics is small, but growing. In 2017 and 2018, one of the most talked about trends across industries was Robotics Process Automation (RPA). By 2025, technological innovation or immigration will be supplementing the workforce. As sensor technologies open up new robot applications, the total number in facilities maintenance will increase. The Top 10 Trends in Facilities Management is telling us what to expect. But, are we ready? There are no technological constraints to what is possible. Yet, for workplace to be smart, it must have smart insights and smart strategies. Interested in gaining more insights on the impact of the Top 10 Trends in Facilities Management on companies and how we can better manage it? 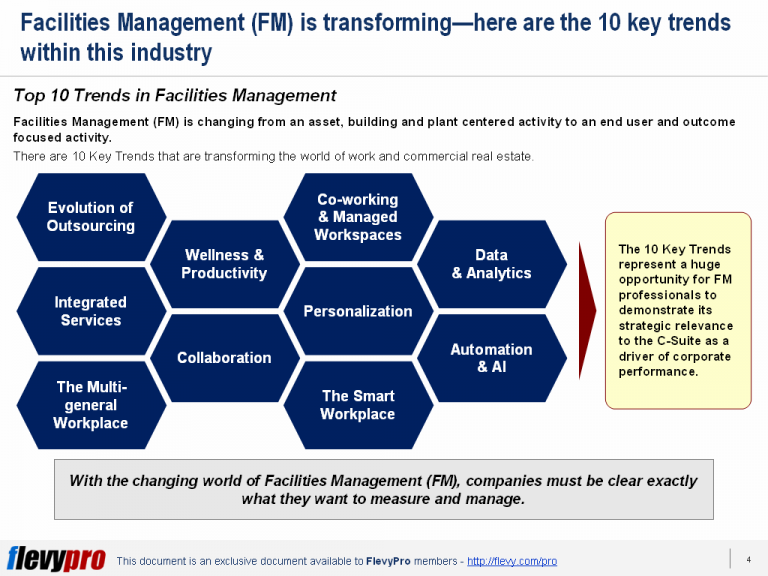 You can learn more and download an editable Powerpoint about The Top 10 Trends of Facilities Management here on the Flevy documents marketplace. How Do We Create Leadership Pull for Operational Excellence?